If you are willing to undertake a spiritual journey, then India is the best place to start with. Here is the list of spiritual ashrams in india. 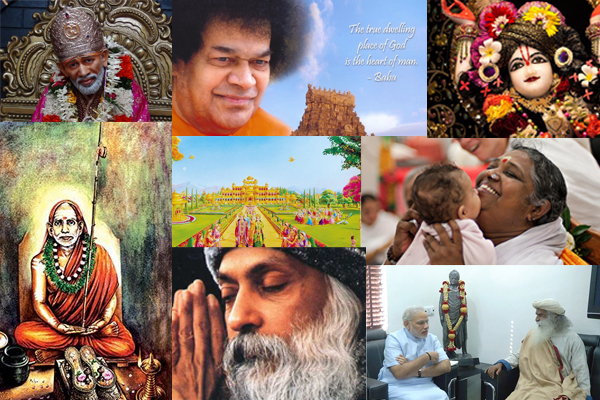 If you decide to visit India, you will definitely come across most distinguished spiritual gurus and ashrams in India. From Baba Ramdev who teaches Pranayama to Mata Amirthanandamayi, who takes you on a soul satisfying spiritual journey you will come across numerous personalities teaching the same art of living. Even though the technique is different, the aim is similar in every ashram teaching the same art of living. In other words, they strive hard to make the people spiritually aware and contribute to the social good. Iskcon is the short form for International Society for Krishna Consciousness. It is a branch of the monotheistic Gaudiya Vaishnava tradition within Hinduism dating back 5000 years to Lord Krishna Himself. Iskcon was founded by Bakthi Vedanta Swami Prabhupada. The main purpose behind the Iskcon movement is to teach people the science of Krishna consciousness, as given in Bhagavad Gita(Hindu’s sacred book) and other age old sculptures. This movement is successful through the establishment of “Hare Rama Hare Krishna Iskcon Temples” all over India. Developing transcendental pastime places dedicated to Lord Krishna. Propagating spirituality, unity, peace worldwide. There are two types of devotees for this movement. They are congregational devotees and Full members. Congregational devotees practice the movement’s teaching in the real life at home and work and then worship at congregational temples. Whereas, full members live at Hare Rama Hare Krishna temples and live an ascetic lifestyles of devotion. Isha foundation is a non-profit organization founded by Sadhguru Jakki Vasudev. The main aim of this foundation is to teach the yogic science for the physical, mental and spiritual development of an individual. It has approximately 150 centers worldwide and strives hard for the upliftment of destitute children, rural people and embattled women. Its main centre is present at Coimbatore, Tamil nadu. To know more about this foundation and its other centers, visit the following link of Isha foundation. Amma’s speech greets the visitors to the Anandh ashram. Amma’s simple talk will bring mind as well as soul together. Inspiring quotes to live life successfully. Years after the death of Osho, the Osho ashram at Pune continues to attract people from all the corners of the world. It was found by Bhagwan Rajneesh. It is a perfect place not only for spiritual development, but also for the rejuvenation and relaxation. People from different country often visit this ashram and practice meditation which takes place on a daily basis. Osho believed that awareness, love, meditation, and laughter are the greater values of life. Thus, this ashram mainly teaches meditation which makes you realize the real value of life. Sri Satya Sai Baba is one of the most revered spiritual leaders of the 20th century. From a young age of 14, he is working towards the welfare of others and guiding them in right direction. The main ashram of Sai baba is at Puttaparthy and it is known as Prashanthi Nilayam meaning “Adobe of highest peace”. Good behavior and morality must be strictly followed in everyday life. Having this lists of spiritual ashrams in India, those who wish to take a spiritual journey can readily take it in any of the above ashrams. For Latest Updates, you can Subscribe Here and get post within your inbox. Do share this post and spread the seed of spirituality to others.